No Dummies here — our clients and friends tend to be very bright people. Because they also tend to be very busy, we thought it might be helpful to use our most recent closing to provide a brief primer about middle market mezzanine financing. 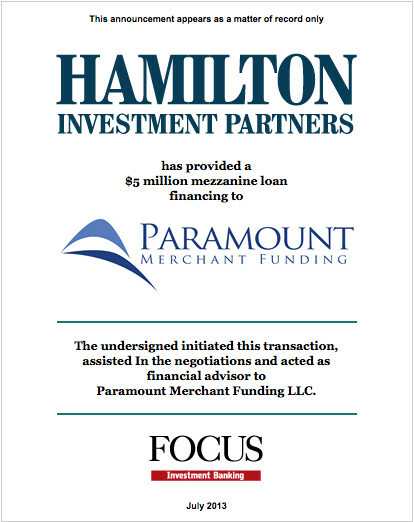 You can click on the tombstone image to the left to get the full details of the $5 million mezzanine debt placement we arranged for our fast growing, innovative client, Paramount Merchant Funding LLC. 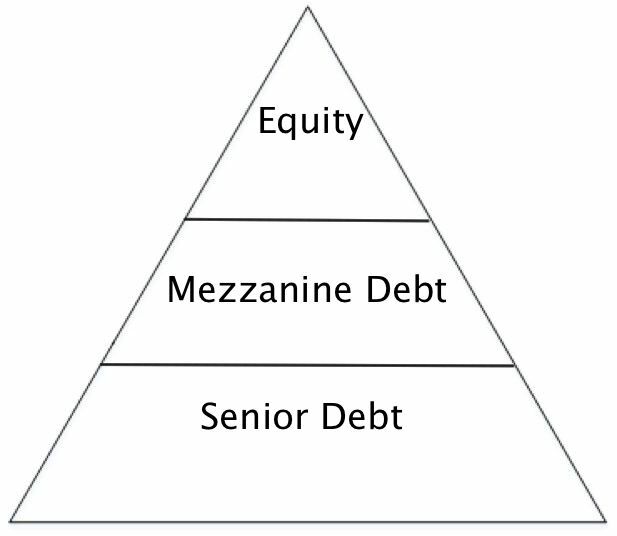 Mezzanine debt is a key component of leveraged private equity financial structures, but it also serves an important role for companies operating in the middle market. As companies grow rapidly, their capital needs frequently outstrip the capital available to them. Typically new enterprises are funded with the founders’ personal capital and loans supported by their personal assets or credit. Often they reach out to friends and family to provide additional support. Additional working capital may be provided by a factor or an asset based lender; however, if growth is rapid, the business will eventually outstrip the limits of these resources and the founder’s personal financial resources will not support continued growth. For a step-by-step video how-to guide for obtaining mezzanine financing, click on the image below and view the tutorial. To download the associated PowerPoint Slides click here. In the past the needed capital was frequently provided by banks which relied upon the borrower’s character in addition to the liquidateable value of its assets. That is a thing of the past. Today, banks without clear collateral support to back their loans will soon invite the ire of regulators. 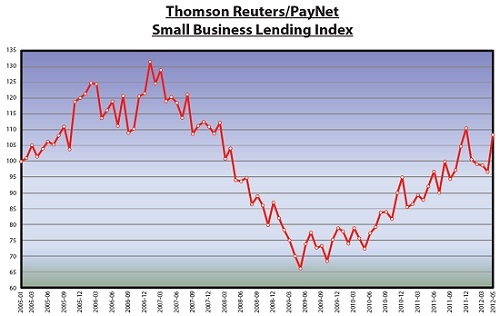 With this regulatory threat hovering over them, most bankers have effectively abandoned the small business community in its time of need. A Wonderful Life for Community Banks? During the yearend holidays we reach out for the comfort of the familiar. One of the best ways to do that is to revisit films with a seasonal focus such as White Christmas, Miracle on 34th Street and most particularly It’s a Wonderful Life. Directed by Frank Capra and released December 20, 1946, the film, starring Jimmy Stewart and Donna Reed tells the story of a young man, George Bailey, who was plunged into a difficult and entirely unfair situation as a result of the actions of others beyond his control. George is driven to a point of such deep despair that he is considering suicide. He is saved by a guardian angel and the support of those for whom he has toiled unselfishly for years. For decades the film has provided us with the assurance that, if we just do right by others, we will ultimately be redeemed. Great film of course, but did you ever think about the underlying issues that forced George Bailey to consider jumping off a bridge? Bailey begrudgingly inherited a community-oriented Building and Loan Association in the 1940’s when just before Christmas his Uncle lost over $8,000 on the way to make a deposit. The regulators had just arrived at the Building and Loan and found the loss. They promptly issued a warrant for George’s arrest. Even though he was innocent George was so unwound by the actions of the regulators that he felt his life was at end. Permalink | | Comments Off on A Wonderful Life for Community Banks? In a recent announcement, First Virginia Community Bank announced the acquisition of 1st Commonwealth Bank, a small de novo bank started in 2009. The transaction is pending regulatory approval and will be treated as stock for stock and the value to book was about 97%. This will become a common trend over the next three to five years with a Wall Street projection that some 20% to 30% of banks will be merged before it is all done. Why is this typical of what the future will hold? Third, to be competitive and sufficiently profitable to maintain such a position in the market, community banks must achieve a minimum asset size of around $1 billion. What is behind the higher regulatory capital ratios? The lingering effects of the economy and the Great Recession have made a significant impression on all banks, especially those serving their communities. The asset devaluation of real estate (both residential and commercial) took a significant chunk out of capital and there are no expectations for a quick recovery. Hence, many banks are in a precarious position in which the future is still unknown.